In this review, we’ll be taking a look at a canister vacuum. We’ll be looking at the Dirt Devil Vacuum Cleaner EZ Lite SD40010. The Dirt Devil EZ Lite is 22 inches long and 13.2 inches tall. Additionally, it is 12.8 inches wide and weighs 11.8 pounds. The Dirt Devil EZ Lite comes with a variety of different accessories. Included we have the crevice tool, a dusting brush, a little clamp that clamps onto the main hose and then holds these two tools, and additionally, we also have the primary floor cleaning head which is our multi-surface floor clean. With the dusting brush, you have the soft bristles on there which makes it ideal for cleaning more delicate surfaces around your home. The extendable wand provides an approximate four feet of extra reach. This is the multi-surface cleaning head, which works for both carpeted and hardwood floors. It comes in two different configurations, and this configuration here, this is ideal for your carpeted surfaces. 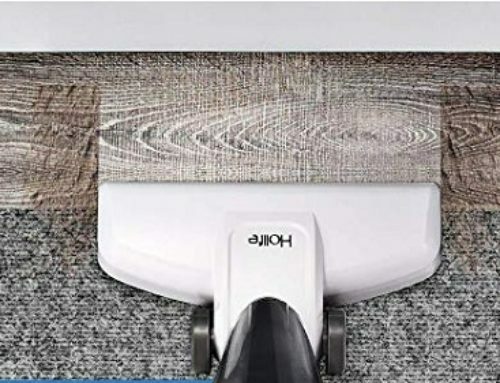 However, you can also press this button on the top of the cleaning head, which will extend firm bristle brushes along the front of the cleaning head as well as rubber guards in the back making it more ideal for hardwood floors and other hard surfaces. Lastly, we have the crevice tool which is great for getting in tighter to reach spots. One of the more unique features in the Easy Lite is their retractable cord system. The retractable cord system is incredibly simple. You simply pull out as much or as little of the cord as you do need. And then when you’re done you simply hold this button and the system retracts it back inside the base. All the vacuum cleaners we test go through our standard cleaning tests. For these tests, we complete 12 unique tests testing four different debris types on three different floor types. Our floor types include: an engineered hardwood floor, low pile carpet, and a high pile carpet. Our four debris types include: rice, kitty litter, cereal, and sugar. Overall cleaning performance was quite good across all of our tests. Nine of the 12 tests scored nearly flawlessly anywhere from around 99% to 100%. The only tests where we saw significant issues were the cereal tests. During our cereal tests on all three floor types, we saw issues where the floor head was simply too close to the ground as a result it was pushing the cereal back and forward as opposed to actually sucking it up. 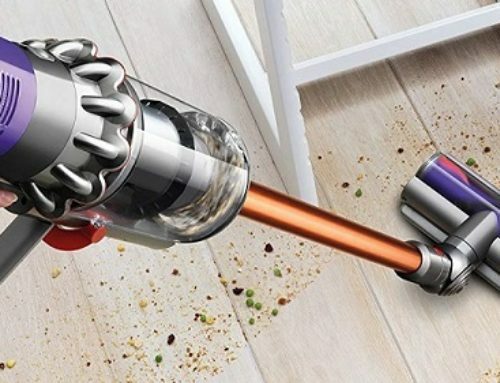 In order to remove cereal with this vacuum, you would need to place the floor head directly on top of that cereal, or any other large debris that you’re trying to remove, or use the crevice tool or just the standard hose, in order to apply direct suction on top of those debris. Usability is fairly straightforward on this vacuum cleaner, plug it in, turn it on, and you’re good to go. You do have a variable suction control on the top of the unit allowing you to increase the level of suction, depending on the floor type. In addition, you also have a slip ring which provides even more variable control to the suction. Maintenance on the Dirt Devil EZ Lite is fairly simple and straightforward and involves maintaining and replacing the three filters. On the interior of the vacuum, we have the HEPA filter, which is fairly substantial. Additionally, right behind the HEPA filter, we also have this dust cup filter which is just a simple piece of foam for added filtration. Lastly, on the rear of the vacuum, we have the post-motor filter which rounds out the triple filtration system on the Dirt Devil EZ Lite SD40010 Canister Vacuum. Annual maintenance cost for the Dirt Devil EZ Lite aren’t too expensive coming in at around $14 to $24 per year depending on how often you’re using the vacuum. All our vacuum cleaner reviews go through our noise test. For this test, we use a sound meter to measure noise in terms of in decibels at full volume, having that sound meter about three feet away from the vacuum. The Dirt Devil EZ Lite came in at around average, coming in at 74 decibels. So what’s to like about this vacuum? First and foremost, it’s inexpensive. The vacuum is usually around $100, sometimes a little bit less on Amazon, and the cost to maintain is also quite inexpensive as well. Considering the relatively low price, I also like the number of features that we do have on this vacuum. You have the onboard suction control, which allows you to provide a more precise level of suction for either carpets or hardwoods. In addition, you have the slip ring for even greater control, which if you have too much suction, you’re sort of stuck on a piece of carpet or fabric, you hit that and that will alleviate the pressure, and then continue the flow of suction. Lastly, I really love this vacuum has the retractable cord system. It’s something you don’t see on a ton of vacuums so to see it on a vacuum this inexpensive is pretty cool, super easy to use , you just pull out as much you need, and then hit that button and you’re good to go. Next, one of the things we don’t like. First and foremost, the biggest con on this vacuum is simply the wheels. The wheels I would describe as okay. They get the job done. I get why they’re using these wheels considering the price of this vacuum. However, the wheels aren’t super great, and if you’re driving over debris that are likely to stick to the wheels, they can pull that debris in there which can make their rolling function a little bit more difficult. During our cleaning tests, we were dragging the Dirt Devil SD40010 EZ Lite across the testing line where some of the debris were, and some of those debris, especially the smaller debris like sugar, we’re sticking to those wheels and being drug up into the wheel base. And we were having greater difficulty in pulling and moving the vacuum around. The other major con with this vacuum is the absence of a motorized brush roll. Motorized brush rolls are great for helping to agitate carpets and pulling even more debris and dirt out of them. 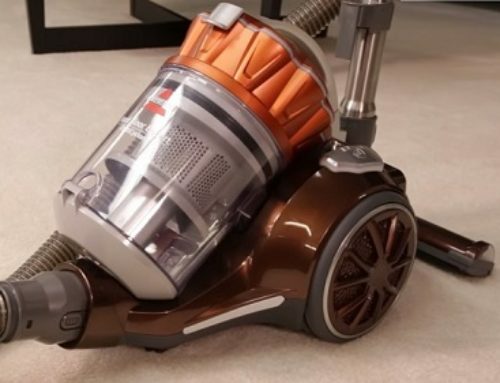 So while this vacuum does have excellent suction, it does not have that agitation level, which in some houses or some types of carpet can be helpful to pulling more of the dirt out. One last con that I would be remiss if I didn’t mention, and it’s something we noticed during some of our final film tests, is just the build quality on the connection point of the hose itself. It has managed to detach itself several times, even without depressing the button which should create that locking lash. We are not sure if this is just a build quality issue with our particular unit or if this is something more broadly problematic with the series itself.